Monash University, together with the Bureau of Meteorology, Melbourne Water and Wageningen University (The Netherlands), is seeking to demonstrate that data on the time-variation of signal strengths for microwave links, such as those used to transfer data between mobile phone towers, can be used for estimating rainfall in the Australian context. Whilst already demonstrated in Europe, this is the first study in Australia. Such data can complement the sparse rainfall measurement networks in and around our capital cities, and is expected to drastically improve the accuracy of quantitative rainfall estimates derived from weather radar. The project, funded by the Australian Research Council, is based around the existing dense network of backhaul towers (primarily mobile phone tower base stations and antennas) in urban areas. In Melbourne, the network is operated and owned by multiple agencies and operators. While these links operate at diverse frequencies, only frequencies above 15 GHz can be used to derive rainfall rates. These new rainfall maps (or rainfall products) need to be validated using existing rainfall estimates, using for example the network of rain-gauges, in addition to information on rainfall type and signal attenuation. For this reason, Monash University is currently deploying ground-based instrumentation to validate and improve link-derived rainfall products. This includes: (1) A high-end X-Band dual polarisation weather radar (Meteor 60D, Selex, Germany) covering the Melbourne region; (2) Microwave scintillometers operating at 24 and 38 GHz to sample microwave signal intensity at high frequency; and (3) A number of disdrometers, tipping bucket 0.2 mm resolution rain-gauges and automatic weather stations. The monitoring setup is spread across different sites in Metropolitan Melbourne. Raindrop size distributions and velocities are measured over 30 second intervals by laser disdrometers (Parsivel 1, OTT, Kempten, Germany) and stored by either a CR300 or a CR1000 depending on the site. An automatic weather station (WTX520, Vaisala, Finland) is used to monitor air temperature, humidity, pressure and wind velocity and direction. The microwave scintillometers are installed a few kilometres apart, having signal strengths measured every second with averages and other statistical data stored every 30 seconds on two CR1000 with compact flash extensions. 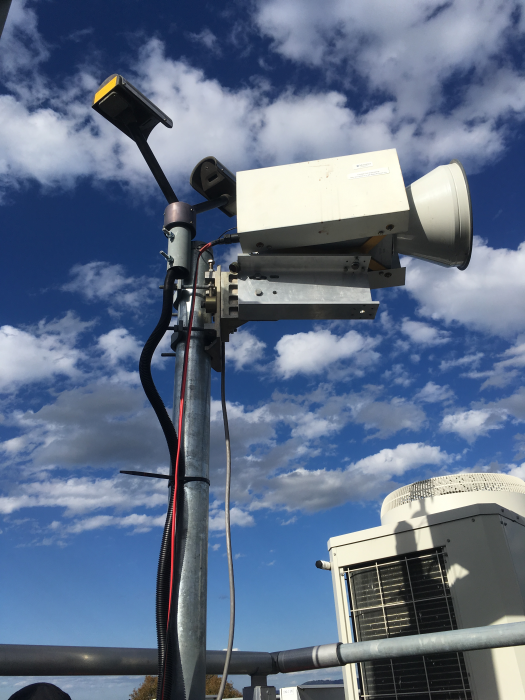 This project will set a baseline of understanding to enable the use of Commercial Microwave Links as weather sensors, in particular rainfall, for the very first time in Australia.